After opening up the Alcântara Space Base and dropping visa requirements for US tourists, president Jair Bolsonaro visited Donald Trump on Tuesday and promised that Brazil will support the new moves against president Nicolás Maduro in Venezuela and import a quota of US wheat without tariffs. In exchange, Trump vaguely signaled he will back Brazil’s entry into the Organization for Economic Cooperation and Development (OECD) – and he gave Bolsonaro a US soccer jersey. 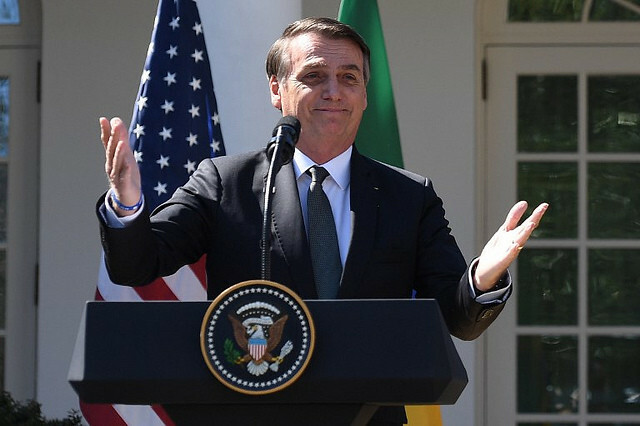 Gilberto Maringoni, a foreign affairs professor at the Federal University of the ABC Metropolitan Area, said Bolsonaro’s visit to the United States was a “fiasco,” and even the possibility of joining the group of the world’s richest countries – which, as the Brazilian government puts it, would attract foreign investments – didn’t pay off the visit. Maringoni argues that the United States actually wants Brazil to renounce its developing country status in the World Trade Organization (WTO) in order to apply to the OECD, an organization that gathers the so-called developed countries that advocate for principles of representative democracy and market economy. The status makes it possible, for example, for Brazil to push protectionist policies for its productive industries. Brazil has been a member of the WTO since 1995, as part of a list of countries who are granted special treatment, which means they get advantages for being an emerging – or developing country. The United States, on the other hand, is against that kind of distinction and demanded Brazil was removed from the list. Maringoni also addresses Bolsonaro’s statements regarding a possible armed intervention in Venezuela. “Venezuela cannot continue the way it is right now. That people has to be liberated and we count on US support for this goal to be reached,” the Brazilian president said, mentioning the American economic and military power. The scholar says that such a statement weakens Brazil’s foreign policy, which has been traditionally based on the principle of peaceful conflict resolution and non-intervention in domestic affairs. As a consequence, that could jeopardize Brazil’s position as a mediator in South America. “He comes back empty-handed,” Maringoni argues. “When Brazil takes sides in the Venezuelan conflict, the side of the opposition, of Juan Guaidó, it loses ground to mediate not only with Venezuela. It loses ground as a mediator for any situation,” he said, as it moves away from one of the cornerstones of Brazilian foreign policy, non-interference in domestic matters. Maringoni says that while the Eurico Dutra and Castello Branco governments, during the military dictatorship, and the Fernando Henrique Cardoso administration, in the 1990s and early 2000s, were famously closed to the United States, never did Brazil align itself so much with Washington as it is happening now under Bolsonaro. Maringoni adds that Bolsonaro’s foreign policy is similar to the “entreguismo” (a subservient foreign policy that aimed to sell all of the country’s resources to foreign interests) of the military dictatorship years, between 1964 to 1985. As Juracy Magalhães, the Brazilian ambassador to Washington in 1964, once said: “What’s good for the United States is good for Brazil.” That means the government is willing to give in to the White House’s interests, even when it is unclear if the country will get anything in exchange.